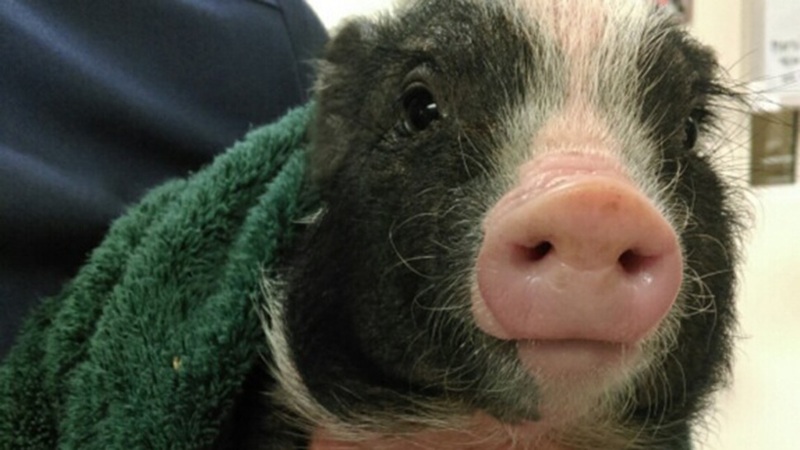 This little piggy caused a hubbub in San Francisco. The Department of Animal Care and Control received word Tuesday morning of a wayward piglet — who has since been named Janice — running scared through traffic at Dolores and 19th streets in the Mission District. A crowd of good Samaritans and an animal care officer tried to catch the "precocious porker," animal control officials said in a press release. Janice and Brother Damian of the Society of Saint Francis. March 8, 2016. "After a merry chase, good fortune smiled down upon" Janice, who was scooped up by Brother Damian of the Society of Saint Francis, the Department of Animal Care and Control wrote. 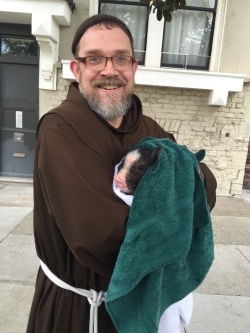 "Only in San Francisco could a wayward piglet expect to be rescued by a representative of the Patron Saint of Animals," Animal Control wrote. As of Tuesday evening, the black and white pig was resting comfortably at the department's 15th Street location, department officials said. The person who owns Janice has five days to claim her. Otherwise, she will be sent to a rescue group that "specializes in all things pig," according to officials. "It’s just another day at the office for us," the department's Executive Director Virginia Donohue said. "We’re here to shelter all types of animals — piglets included."